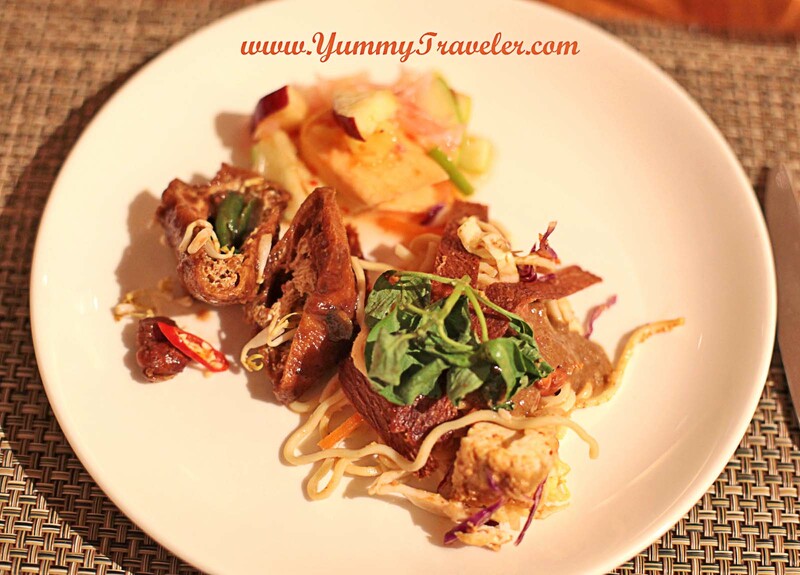 Couple weeks ago I was invited by Mandarin Oriental Hotel Jakarta, to taste some of their Betawi's food promotion. Yes it's a celebration of 486th Anniversary of our lovely city, Jakarta! As you know, Betawi people are the descendants of the people living in Jakarta from around the 17th century. So the culture and of course the food, has always been close to our heart. 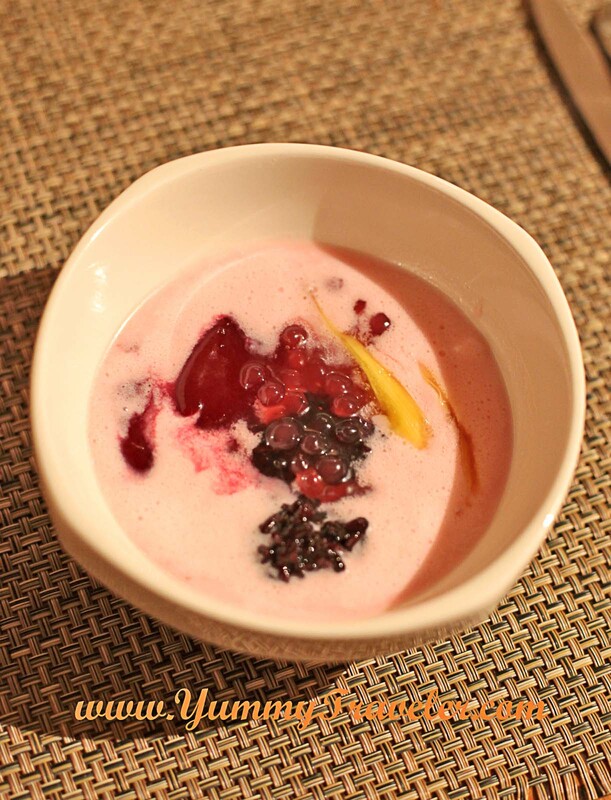 The Flavours of Betawi was held at Cinnamon restaurant, from 17 - 22nd June 2013. All the Betawi's food that was presented there was quite vary. They're also serve their own Gado- Gado station ! and also, the traditional music ! 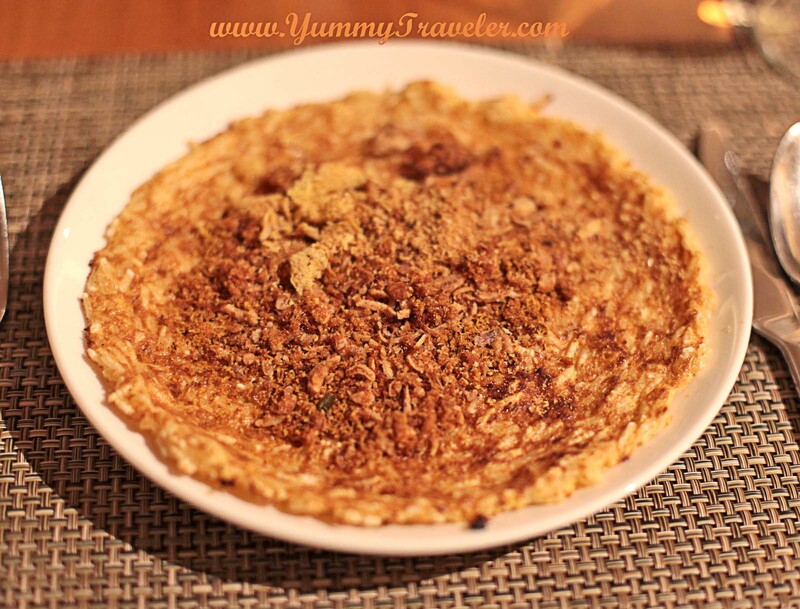 Started with the most food that I always crave when Jakarta's Fair festival on Kemayoran was held, Kerak Telor ! It is made from glutinous rice cooked with egg ( using duck egg was more tastier ! ), slowly cooked on the small wok and charcoal fire. It is served very thin and crispy, and using serundeng (fried shredded coconut), fried shallots and dried shrimps as the topping. Yum! From the appetizer station I also tried Rujak Juhi, Tahu Gejrot and Rujak Buah. Rujak Juhi is an Indonesian salad contains fried tofu, fried boiled potatoes, fried shredded salted cuttlefish, cucumber, egg noodles, lettuce, cabbages, peanut sauce, vinegar, chili, and fried garlic. Tahu Gejrot is a fried tofu which was cut into small pieces and served with sauce made from blending brown sugar, vinegar, and sweet soy sauce. And Rujak Buah is another Indonesian Salad consist of fruits. 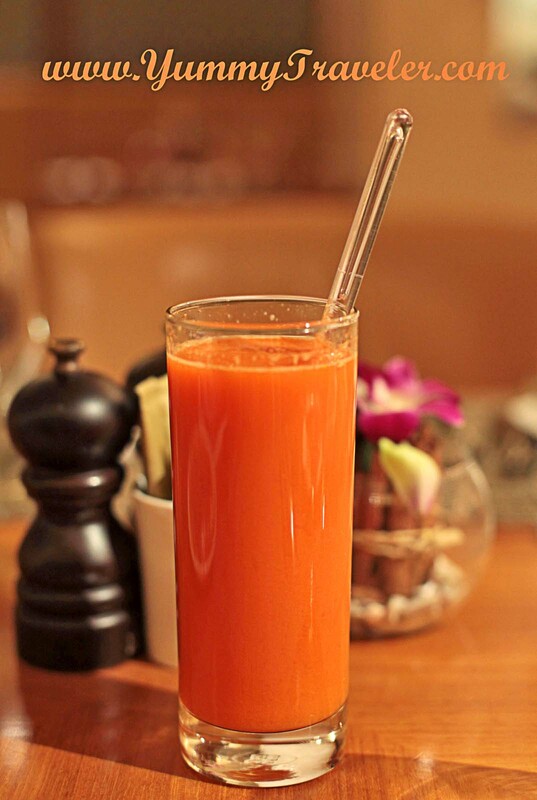 The Rujak Buah was also using Pomelo fruits, so refreshing ! From the soup station, of course we can't miss Soto Betawi. 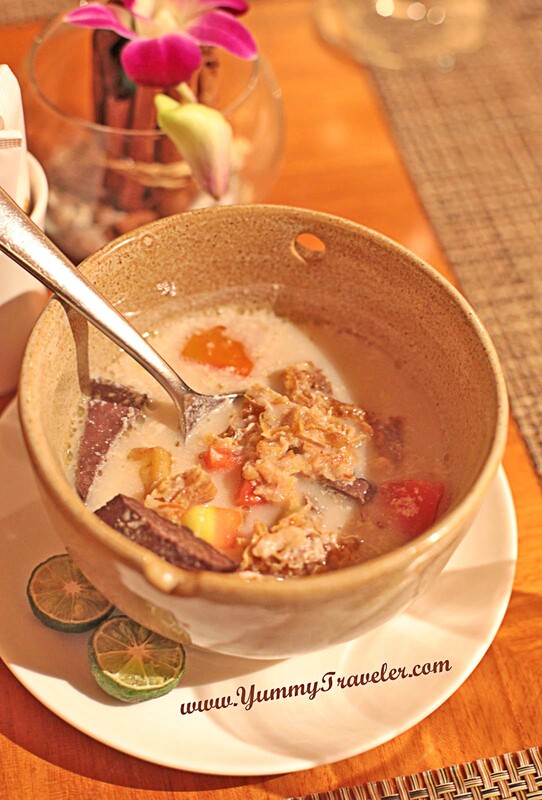 Soto Betawi is a typical Indonesian soup with beef and offal, cooked in coconut milk broth. In Cinnamon, the beef tripe was fried first, so it gives a nice crunchy textures to the soup, however I feel the soup was quite light compared to usual Soto Betawi. 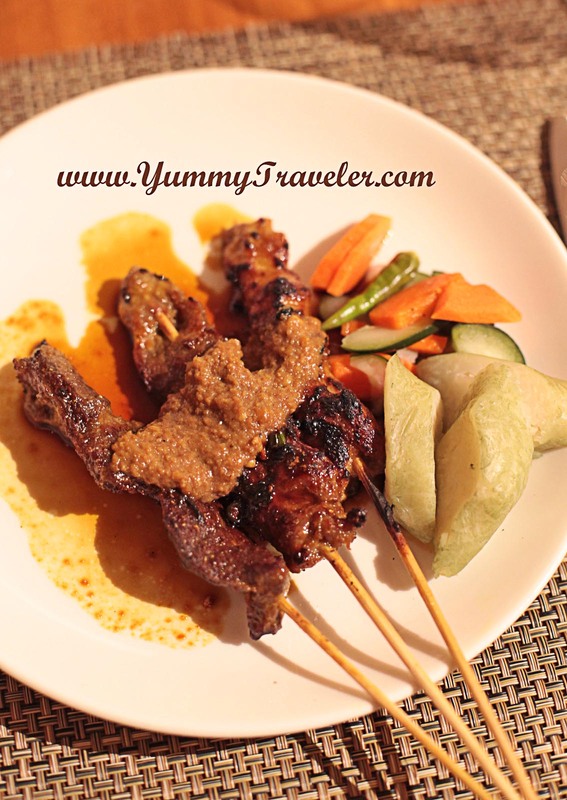 From the grilled station is a one typical Indonesian dish, Sate Ayam. The grilled chicken served with peanuts sauce. The meat was so tender! And the main course, I've tried Nasi Ungu, Gabus Pucung, Semur, Sayur Babanci and Opor Ayam. 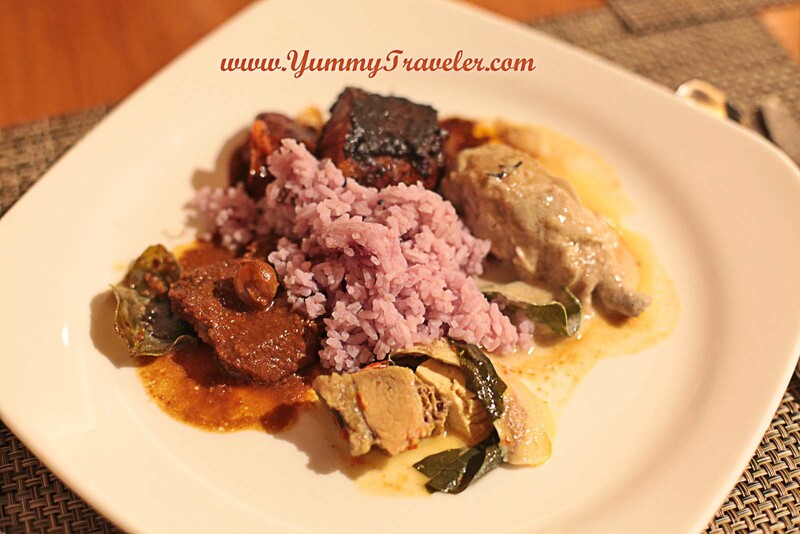 Nasi Ungu is the usual rice colored with purple sweet potato, tasted just like the usual rice! Gabus Pucung is catfish cooked in Kluwek and many other spices. I can tell that their Gabus Pucung was the bomb ! Very tender, melts in your mouth ! Semur is a beef stew cooked with sweet soy sauce, and nutmeg and cloves also added for the taste. Sayur Babanci is a unique Indonesian stew dish made with coconut and other spices, but the taste was still very light. Opor Ayam is a chicken cooked in coconut milk, not like Thai Green Curry, this one is not spicy at all. Yum! 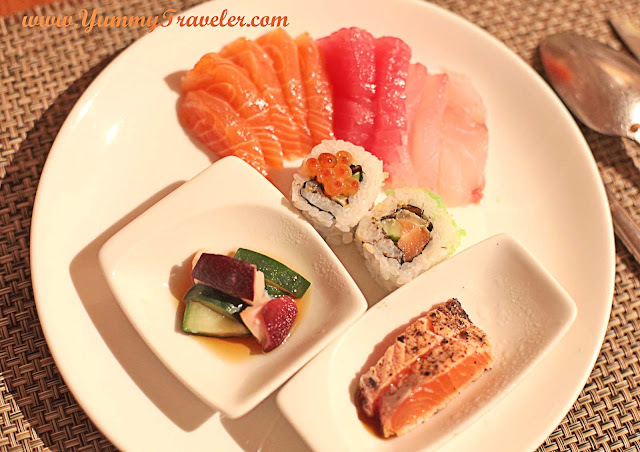 Besides all the Betawi's food, they also served Japanese food that surely I can't help myself to resist ! :p I can tell they served good quality of sashimi and sushi! 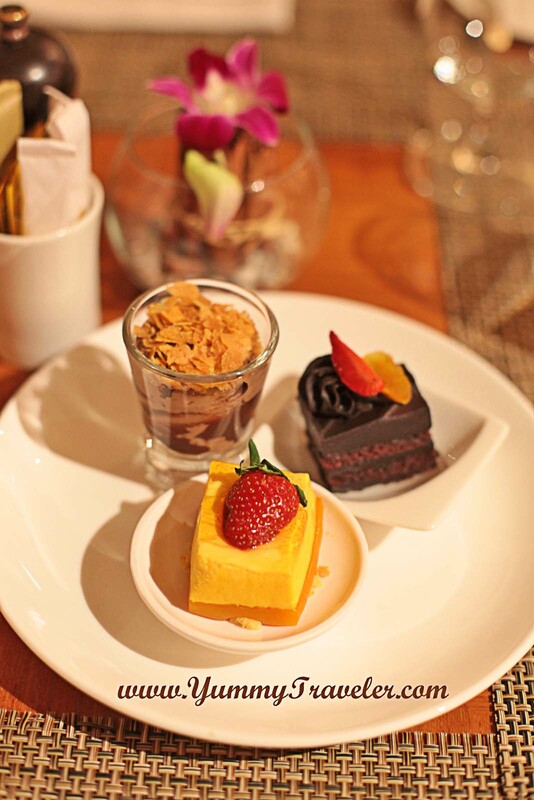 For the dessert, besides Kue Balok and Kue Putu, they also served Es Doger. 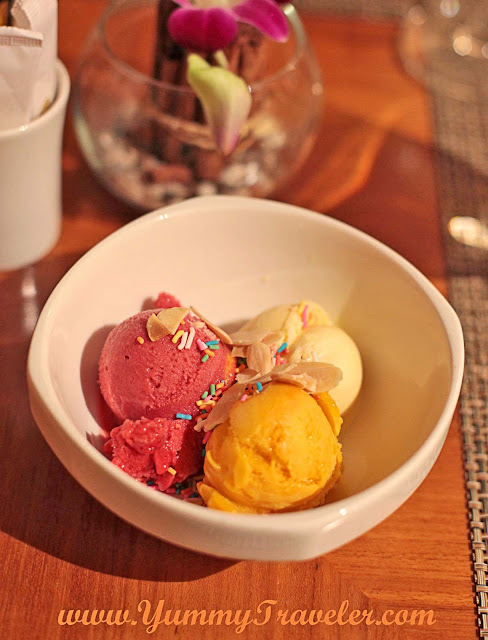 Es Doger is a pink shaved ice made from coconut milk, served with avocado, jackfruit, black glutinous rice and red tapioca pearls. Too bad the shaved ice already melted. The other dessert that I also tried is their varieties of ice creams, and cake. Their signature chocolate cake was really yum!